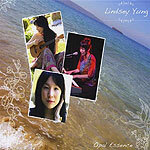 Turbula - Music - Review of "Opal Essence"
San Diego singer-songwriter Lindsey Yung stands out in a crowded acoustic scene in the area for several reasons, all good and all present on her new CD. Playing keyboards rather than guitar gives her a different sound than most of the county's folk singers. (And, no, the keyboard is not acoustic, but her near-constant presence in local coffee houses and at open mic nights have made her a treasured member of the local acoustic scene.) Adding to her distinctive sound is her crystalline voice, reminding of early Kate Bush or Jane Siberry. But what really sets her apart is her songwriting. While most singer-songwriters hew to a folk sensibility, Yung has always been closer to the art rock school  and "Opal Essence" moves even further in that direction than her previous disc, "Fusion." Her songwriting also shows improvement along with the stylistic movement; "Touchstone" is an alluring, hypnotic art rock piece, anchored by Yung's haunting vocals. "Scent of Summer" is a cute little love song with clever word play in the lyrics, and "It Doesn't Get Better Than This" is a catchy, Hawaiian-tinged ode to domestic bliss. While she employs a "wall of sound" approach to the song arrangements and production on the new album, it's done so well that it never sounds anything other than organic. Whether it's a bass line coming in atop her vocal mid-refrain or a slowly growing crescendo on keyboards, it all adds up to work brilliantly.